Windy was Misty's first granddaughter and Stormy's second foal. She was a tall chestnut pinto mare born on Beebe Ranch. There is some confusion to who her sire is. The Pictorial Life Story of Misty has Windy's sire listed as Lightning, making her a full sister to Cloudy, Thunder, and Breezy. Windy's owner for the second half of her life, Mike Pryor, has her sire listed as Al-Marah Sunny Jim, but this is false as both Marguerite Henry and Maureen Beebe confirmed that Windy was not by Al-Marah Sunny Jim. Actually, Windy's sire was a Thoroughbred stallion owned by Ralph Beebe at the time. The stallion and Stormy weren't supposed to be bred, but it happened, and the result was Windy. In 1971 there was a newspaper article about Ralph Beebe as a Thoroughbred trainer. The Thoroughbred blood explains Windy's height and build compared to the other Misty family ponies. Windy's temperament changed like the wind. She could be sweet and gentle as a kitten one time, and then be strong willed and wild as a mustang the next. In her later years, Windy became mellower. She was attracted to people and loved their company. Windy spent the first few years of her life on the Beebe Ranch with her relatives. When Ralph Beebe died, the Misty family ponies were moved to the Chincoteague Miniature Pony Farm which was owned by Paul and Helen Merritt. There was room for the ponies and they could receive better care. Shortly after Tornado was born, he and Windy were sold to Mike Pryor of Waynesboro, Pennsylvania. Mike prized Windy very much and took her to various events to promote the Misty legacy. Windy had a surprise for Mike. 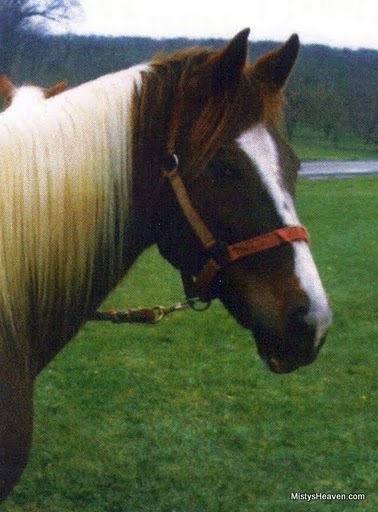 In 1988 Windy had a chestnut pinto filly named Wind Storm. She was a full sister to Tornado and Hurricane, who were sired by their brother Cyclone. Windy has made several appearances in literature. Windy was written about and listed on the family tree in The Pictorial Life Story of Misty. A Pony Promise by Lois Szymanski tells of Windy's adopting Misty II. Windy of Chincoteague by Ronald Keiper tells of Windy and a few other ponies that Mike had bought from the Pony Farm. Nightmist: The Miracle Pony by Jessie Ann Friend also features Windy. Windy lived to be 29 years old. Around that time, she was involved with an accidental breeding when her grandson Windjammer was allowed to share her pasture. The result was Windy becoming pregnant for the seventh time. She successfully foaled Nightmist, but the strain of foaling proved too much for her and she died shortly after that in October of 1998.